To show support for the biodiesel industry all the equipment here at Commodity Classic seems to be displaying the logo in the windows of the cabs. 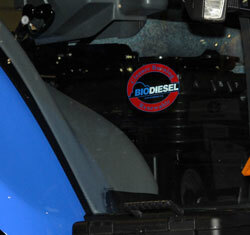 The stickers are supplied by the National Biodiesel Board which also had a booth in the trade show. Representing NBB here was Gary Wheeler, Director of Operations.